Forge Blow off valve for R55, R56, R57, R58, R59, R60 MINI Cooper S turbo. The Forge valve is not really a blow off valve, but this is what it is commonly referred to as it is actually a recirculation valve. It does NOT vent the boost to the atmosphere like a blow off valve, but actually recirculates it like the design of the MINI originally has just that this valve does it faster, and can hold more boost. This Forge valve alternative is a fully engineered solution offering both significantly improved reliability as well as valve related boost response. The Forge valve and installation kit replaces the original unit with a pressure/vacuum operated piston valve that still also retains the desirable OEM ECU control over valve actuation. This product has been thoroughly designed and tested with the expressed intent of offering improved valve response and maintaining ECU control while resulting in absolutely NO fault codes, NO check engine lights, and no adverse effects of any kind. All of the necessary components and detailed instructions are included and everything is designed to make installation as simple as possible. Simply put this valve will improve throttle responce and boost control to enhance the drivability and performance of your MINI. 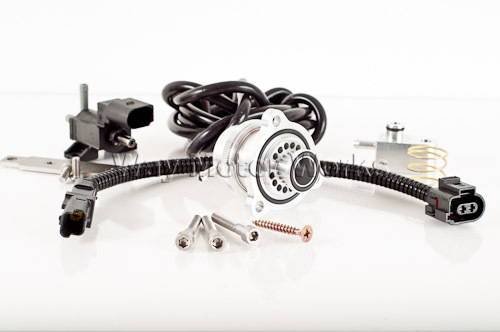 This kit is supplied with an additional upgraded spring (colored Yellow) that may be required if the vehicle has had a significant boost increase. This D/v is vastly superior to the stock D/V and works great with stock tune or aftermarket tune. I have a Cobb A/P stage 3 92 octante Map on my factory JCW and the forge D/V made a huge difference. All the products that I have purchased and the customer service that I have received from Way has been outstanding. Is this worth it? In a word, yes. Stock or tuned, S or JCW, you\'re going to see an improvement. I\'m getting better boost response then the both the stock DV and the WMW alternative. I also can\'t see this failing. Installation is pretty simple too. Easily done with simple hand tools. Is it more expensive then a $25 spring? Yes. But you aren\'t going to find a better DV out there. Agree with MaverickGun. Installed on the 09 Factory JCW, and it makes a night and day difference. The improvement in throttle response and overall turbo performance is easily noticeable throughout the power band. A must if you own a tuned or JCW Mini. I have the stock tune and a Borla S-Type exhaust system. This recirculation valve performs much faster than the stock valve, it does exactly what they claim it does! For me the feeling for the first time driving with the Forge R-valve is it's hyperactive to throttle inputs, almost as it no loss of boost between shifts. I can't recommend it enough and is the best bang for your buck mod available for turbocharged Mini's!